Examples, solutions, and videos to help Grade 5 students learn how to make equivalent fractions with the number line, the area model, and numbers. The following figures give some examples of equivalent fractions using the area model. Scroll down the page for more examples and solutions. 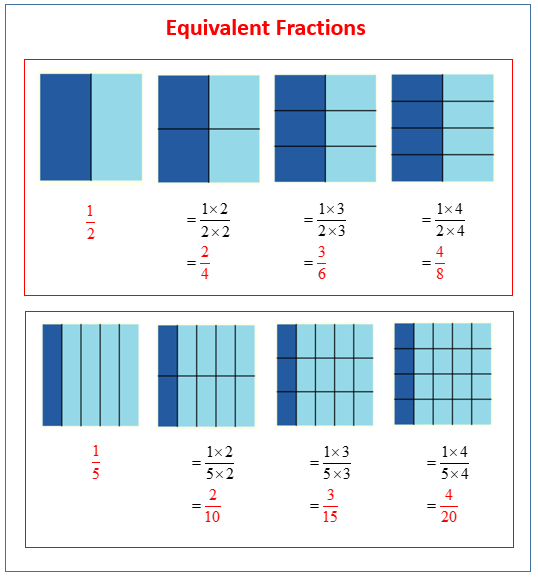 Show that 1/2, 2/4, 3/6, 4/8 are equivalent fractions. 1. Use your folded paper strip to mark the points 0 and 1 above the number line 0/2, 1/2, 2/2 below. Draw one vertical line down the middle of each rectangle, creating two parts. Shade the left half of each. Partition with horizontal lines to show the equivalent fractions 2/4, 3/6, 4/8, 5/10. Use multiplication to show the change in the units. 3. Continue the pattern with 3 fourths. 4. Continue the process with 6 fifths. Do just 2 examples. 2. Use your folded paper strip to mark the points 0 and 1 above the number line 0/3, 1/3, 2/3, 3/3 below. Follow the same pattern as Problem 1, but with thirds. Draw a number line and split it into fourths showing all the way to 5/4. This video demonstrates how to show equivalent fractions using rectangle block drawings. 1. Use your folded paper strip to mark the points 0 and 1 above the number line 0/3, 1/3, 2/3, 3/3 below. Draw two vertical lines to break each rectangle into thirds. Shade the left third of each. Partition with horizontal lines to show equivalent fractions. Use multiplication to show the change in the units. 4. Continue the process with 9 eighths. Estimate to make the points on the number line. Do just 2 examples. 2. Use your folded paper strip to mark the points 0 and 1 above the number line 0/4, 1/4, 2/4, 3/4, 4/4 below. Follow the same pattern as Problem 1 but with fourths.